Lakeland High School was constructed 20 miles south of this site by ranchers from several rural school districts during the summer of 1934. School began that September with 11 students. Constructed of prairie sod, with a sod roof supported by pole rafters, this two-room building housed the classroom and living quarters for the teacher. Outbuildings...two toilets and barn for the students' horses..were also built of sod. The rooms were heated by "prairie coal" (cow chips) picked up by teachers, students and parents. Altogether 33 students attended Lakeland, with 11 receiving high school diplomas. Some students rode horseback up to ten miles; others stayed with families and helped with chores for their room and board. With Nebraska Department of Education approval and through the efforts of the county superintendent and school patrons, students in the sparsely populated sandhills of southern Brown County received their higher education during the hard times of the 1930s. 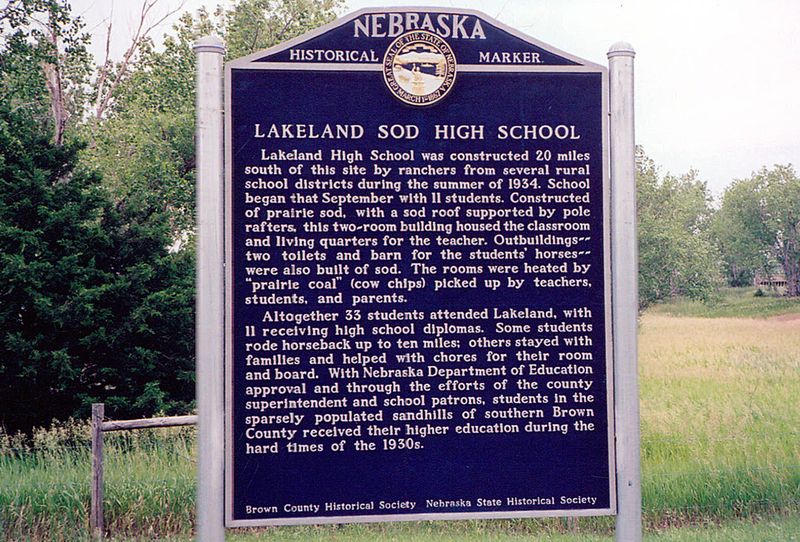 “Lakeland Sod High School,” Explore Nebraska History, accessed April 18, 2019, https://mynehistory.com/items/show/23.